Robert has always loved music; he says it’s his life. As a kid, he remembers singing in the shower to Buddy Holly and Elvis. He’s been to thousands of concerts; the first, in 1964, was James Brown and his Famous Flames. To this day, he calls it the best show he’s ever seen. 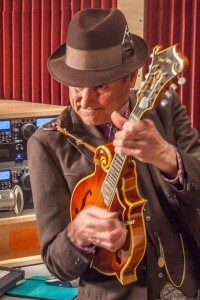 Over the years, he’s had the pleasure of meeting a number of famous musicians, including Earl Scruggs, Doc Watson, Elvis Costello, Emmylou Harris, Leon Russell, and Merle Haggard. Robert is also a musician, playing guitar, mandolin, and harmonica, and providing vocals for many of his gigs. Besides bluegrass, he plays Motown, soul, rock, blues, jazz, American folk, and even some reggae and island music. In his spare time, Robert assists homebound residents and plays music — from the ‘20s, ‘30s, ‘40s, ‘50s, and through to the present — at retirement facilities.